– a small strawberry plot barely visible amongst the couch grass. The strawberries were sorted out last year, and I’ve extended the patch with this year’s runners. I gave the raspberries another chance this summer but they were crap; weedy plants, yellowing leaves and barely any fruit. The poor things – and the whole fruity area – were completely choked by couch grass and bindweed. So this summer I ripped out the rasps and spent back-breaking hours digging and carefully removing as much of the weeds and their pernicious roots as possible. 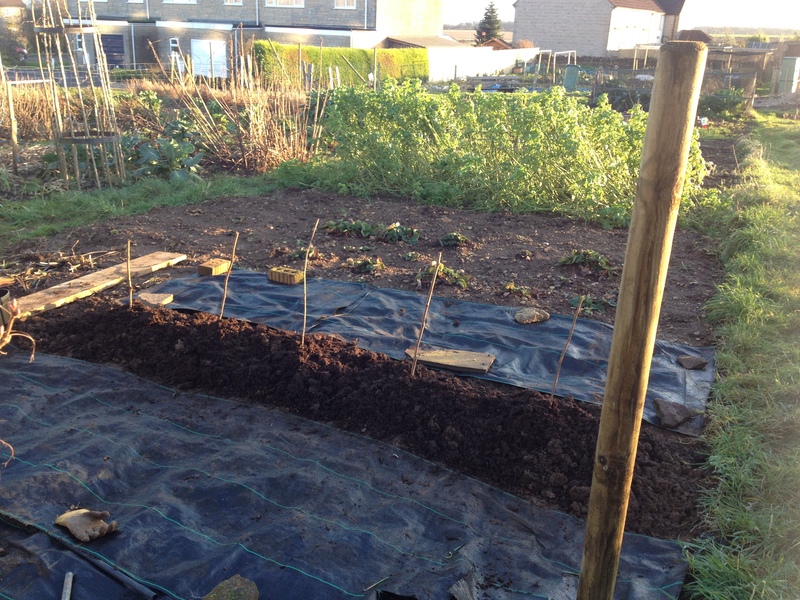 I covered the area with weedproof membrane after to stop it coming straight back (there, at least!). If Father Christmas doesn’t bring me autumn-fruiting raspberries, I’ll have to shell out on some myself. And so to blackberries. This house loves them. My toddler has a bottomless capacity for them, but I wouldn’t let her pick her own this year because our plant was vicious. The fruit was awesome though – definitely a cultivated variety – so Mr MBaF suggested we propagate it and plant it in a convenient hedgerow so we still get to enjoy the fruit on dog-walks! I successfully rooted a shoot; by laying a young growing stem on the soil surface in a plant pot and securing with a tent peg for a couple of weeks. Then I ruthlessly attacked the plant with the loppers and some stump-killer. 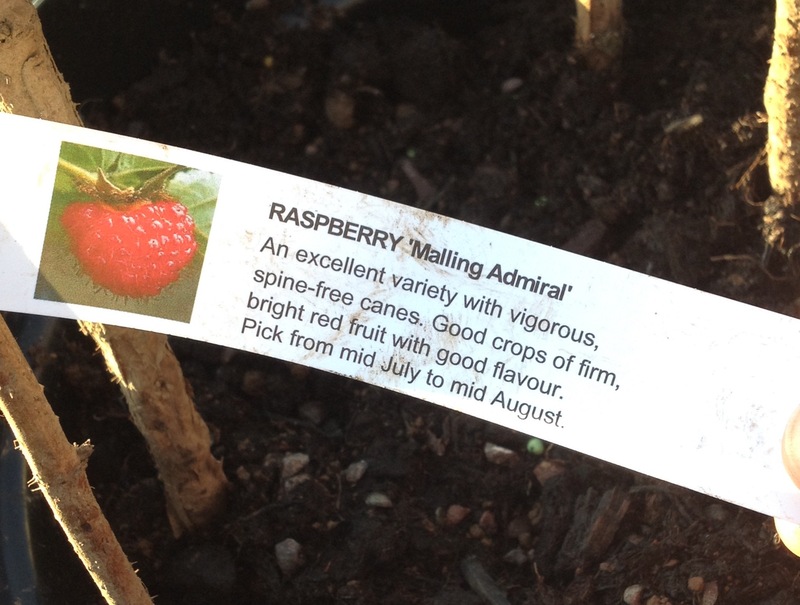 Its friendlier replacement is a tiddly offcut from a delicious and thornless cultivated variety my parents grow. Today Mr MBaF whacked in some fence posts between which we’ll span wires to train it along. Another job jobbed today was to lift and split the rhubarb. That was an interesting experience! The modest hump of scaly matter hid a huge orange crown of rhubarby root. 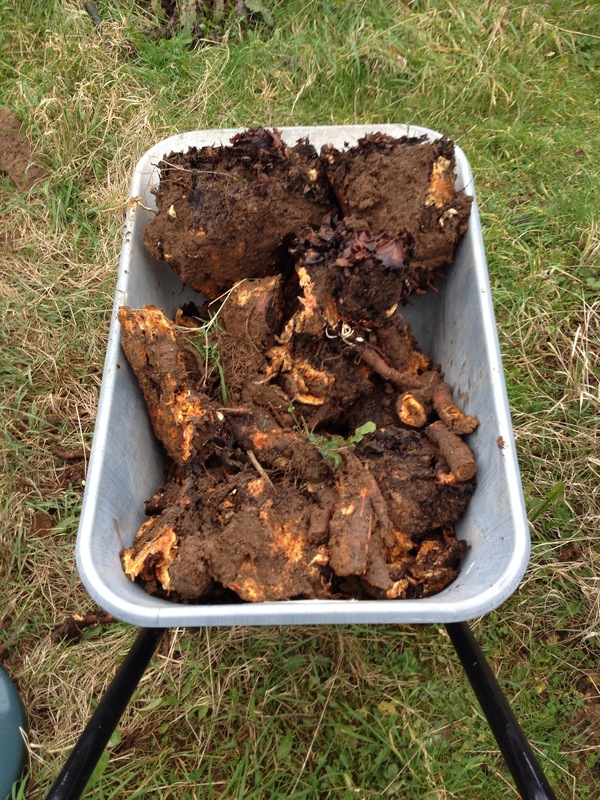 Once it was loosened from the surrounding soil I could make satisfying spade slices through the crunchy bulk. I read somewhere to remove the centre, keeping and replanting sections from the outside. I ended up with a wheelbarrow full of (heavy!) waste, some sections to replant and two small crowns to offer up on our village Facebook page! 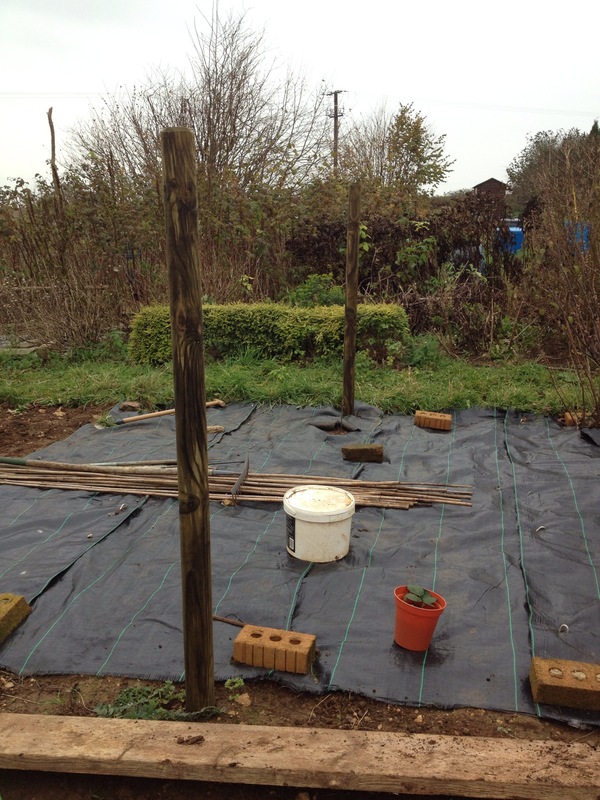 I used a 50L sack of farmyard manure to enrich the planting hole for the refreshed crown. Rhubarb needs moisture-retaining soil and lots of goodness I believe. I haven’t yet told my ‘normal’ friends about this blog, and I’ll continue to delay its ‘launch’ (!) while this post is headlining. Because this is the geeky post I knew I had to write when a big gardening mystery was solved for me by a recent BBC Radio 4 Gardeners’ Question Time. The mystery in question was who on earth is John Innes, and what’s his compost system all about? It was only this year that I realised the basic premise of the numbers (1-3) corresponding to the size/age of the plant. E.g. 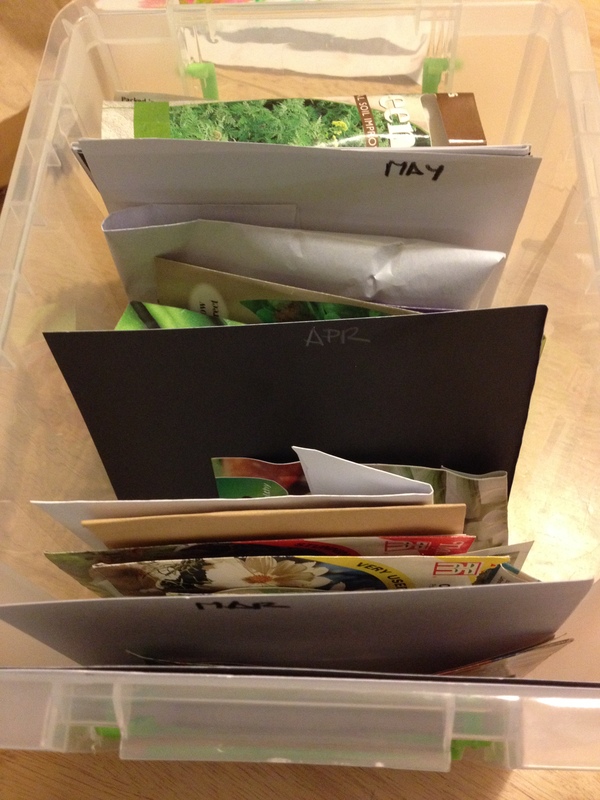 John Innes #1 is for young seedlings, John Innes #2 for potting-on and #3 for mature potting. This, in itself, was a revelation. Then I listened to a recent download of GQT from Norwich while walking the dog, and heard all about the history and development of the John Innes system – as well as about the man himself. As it turns out, John Innes had absolutely nothing to do with horticulture or compost. He was a property developer who [it’s thought] was fed up with employing rubbish gardeners. So he left money in his estate (in 1904) to set up a facility to train local boys in horticulture, in what became the John Innes Centre. It was a gardener there, having trouble growing primulas in the 1930s, who mixed together various organic and mineral components and developed sterilisation techniques to create a reliable seed compost and the various other grades. The ‘John Innes’ recipes were publicised widely during WWII to help the nation ‘dig for victory’. It’s not patented so any manufacturer can use the John Innes name, but there’s a code of practice to try and sustain the quality and consistency of the products. GQT has provided a great factsheet all about John Innes if you’re keen for more of this clarity on compost! Do all you non-UK gardeners use John Innes composts too? NB. A more recent GQT suggested you could grow bulbs on just about any moist substrate. They don’t need nutrition because it’s all stored in the bulb. 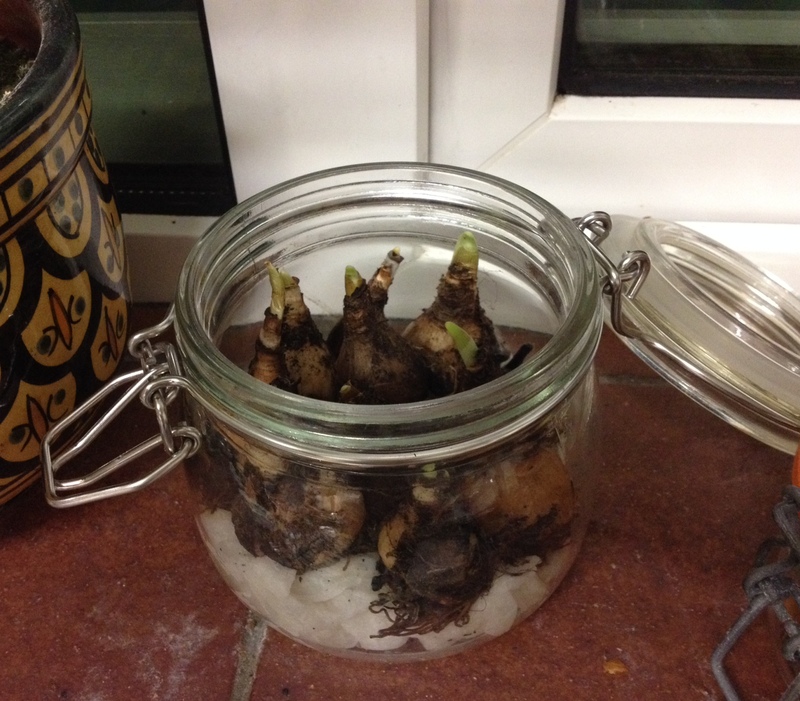 As such I’ve stuck my final few daffodil bulbs on some moist kitchen roll in a nice little jar on the kitchen windowsill. I’ll be dead chuffed if they grow and flower for me to enjoy while I wash the dishes! Having a go at growing a few daffs to brighten up my kitchen before spring.